At the beginning equated with vandalism, street art succeeded in the last decades to win its own specific place in the urban landscape. With spots around the world made famous by Instagram authors and bloggers, it turned into a well established 'artistic category', with its own artists - like the controversial Banksy - and even dedicated exhibitions and events. Urban art creates, besides the colourful context for otherwise derelict city corners, also a space for alternative (sometimes with a political and social context) messages and creativity that although it does not follow accordingly the artistic canons, at least it shares a specific view on the world and its humble inhabitants. Berlin is considered one of the best cities for street art in Europe and beyond, with the remnants of its infamous wall being turned into pieces of art as a way of symbolic social healing. 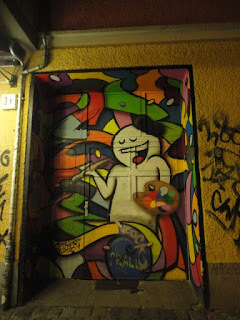 In the last 12 months I tried intensively to reveal not only the famous spots, but also those secret corners of street art on small streets and relatively unknown corners. With a museum dedicated to street art - Urban Nation - inaugurated last year, street art left its unconventional realm and entered the classical, bourgeois consecrated worlds. Where else to have such an institution, but in Berlin? Here are my top selections of street art. I don't always - or in most cases - know the name of the artists, but those interested in this form of alternative art can easily find out more about them and eventually follow their works in Europe and abroad. 9 November 1989 was the end of the Berlin Wall, but its remains are spread all over the city, in a symbolic rememberance gesture to challenge and re-assign value and symbols to the historical meaning. On Mühlenstraße, in between Berliner Ostbahnhof and Oberbaumbrücke is the longest part of the wall preserved: 330 meter of Wall, turned into an open air gallery that can be visited for free. At the very beginning of the Wall, there are the classical images associated with the street art in Berlin, with clear political messages, such this mouth kissing between the Soviet leader Breshnev and the ex-leader of the communist Germany, Honecker. 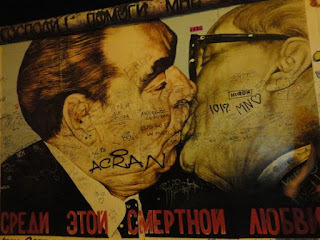 But as you go toward the end, a couple of minutes of walking, the street art is becoming more poetic and the visual essays on the Wall are becoming interesting purely from the point of view of artistic representation. Opposite Warchauerstrasse U1 metro station, in a small part, I've discovered recently other paintings on the walls of the nearby buildings too. A couple of steps away from the Ostkreuz train station, on Revaler Str. 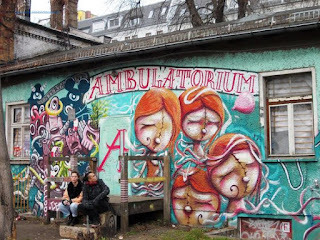 99, at the beginning of the alternative bubbling Friedrichshain, there is another open air street art gallery, hosted in some old yards with a very industrial flair. Events of different kinds are often organised here, but nothing compares tp the high diversity of the paintings displayed generously on the walls. 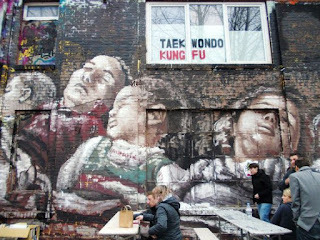 Talking about Friedrichshain, there is always something to discover in this part of Berlin, especially when it comes to the open air art. Especially in the summer time, on streets like Dirschauerstrasse, the locals are easily becoming part of the extensively decorated corners. Last summer, I've spent a chilling weekend afternoon exploring the Helmholz strasse yard, near the Ostbahnhof train station. The colourful diversity of the motives displayed were the perfect backgound of a place with a very challenging architecture too, trying to balance the new and old materials and perspectives. On the other end of the city, in the fancy Grunewald area, the former CIA listening station operating during the Cold War on Teufelsberg, an artificial hill made up from the debris of the bombed buildings of Berlin during the WWII raids, offers nowadays an ironic approach of life. When I visited the place for the first time, almost ten years ago, there was no entry fee but the gentrification reached this part of the city too. People are waiting in line now - not trying to stumble into the holes made into the wires of the former over protected location - and classical guided tours are offered. 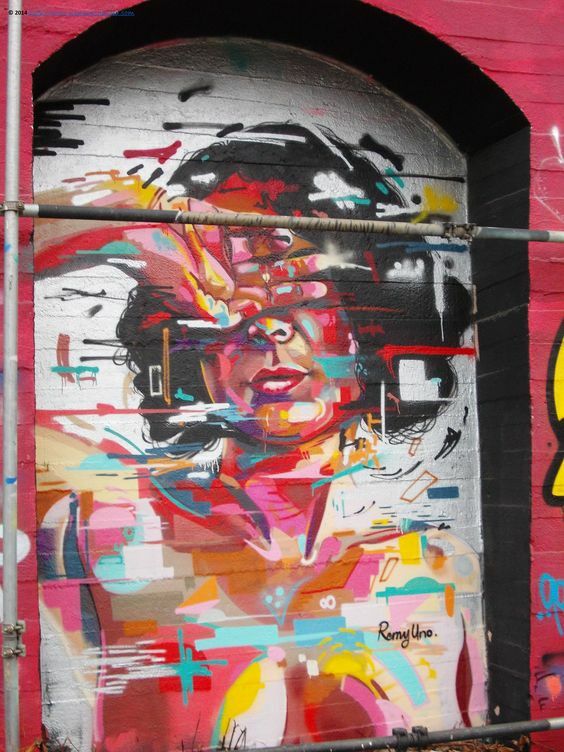 In any case, the street art is still worth a look, especially in the summer, when artists can also be watched at work. Berlin is an amazing example of how different locations receive different meanings and use in the urban network. In Schöneberg, a former train depot was turned in the last decades into a natural park. With protected natural areas and birds are co-existing in a landscape where the former train rails are covered into wild green bushes. 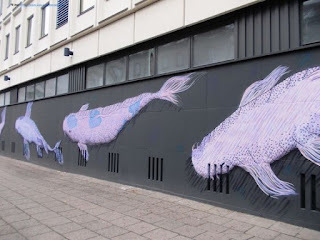 Although the street art here is not so outstanding - compared to the other destinations in the city - especially during the weekend, you can also watch artists at work and it can be an interesting way to get in touch with those creating those pieces of visual enjoyment. 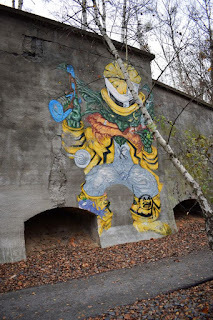 At a great extent, Schöneberg remains a classical West Berlin neighbourhood, and its street art make it often into classical works too, less figurative and more focused on local stories. Which is what I always love about the classical art and writing anyway: the power of telling stories. My favorite piece in this part of the city can be found on Viktoria Luise square, close to the metro station with the same name. I personally think that street art should stay in the street, but I bet there are people that would be rather be introduced to this alternative visual way of expression through the classical means: the museum with its old rituals and framework. Since the last spring, Berlin has its own street art museum, on Bülowstrasse, in the middle of the street art gallery I mentioned before. If you ignore the considerations regarding the nature of this kind of art, you can fully enjoy a visual show with a couple of visually challenging pieces of work. It can be visited for free. Another open air gallery which I really love is on Mehringplatz, a couple of steps away from the Hallesches Tor metro station. 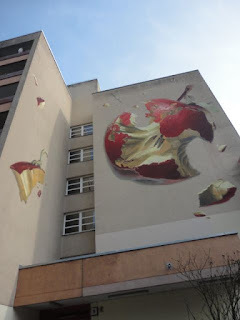 Some of them are already making into the classical catalogue of street art in Berlin. But my favorite so far are those decorating the grey entrances of the blocks of apartments. Expressive unique figures of diversity and life stories told through colours and graffiti strokes. Walking around the area, the art took little by little almost every open wall space available. 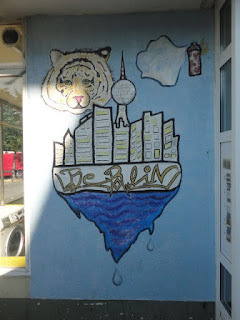 The sport area is one of them, with another classical image associated with the local street art, the elephant carrying the world globe balloon on his trunk. 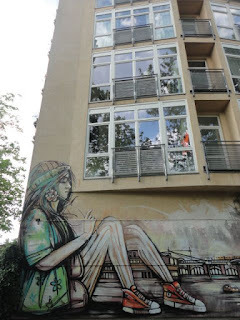 The last summer, I've spent a lovely afternoon out touring the Alt Tegel lake by boat, but on the way home, we stumbled upon a couple of gorgeous works of art, displayed on the anonymous 10-floor buildings on Neheimerstrasse. The details are so impressive that you need a lot of time and a smart camera to catch all the colours, details and possible meanings. 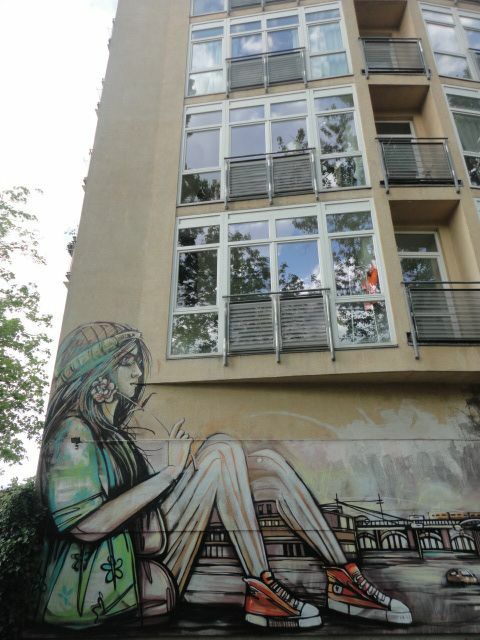 At Mortizplatz, near the Prinzessinengarden, there is another well kept secret for street art lovers in the city. There are a couple of political works too, but nothing compares with this fairy tale inspired works. To discover and love Berlin, you need to train your eyes and open your soul. 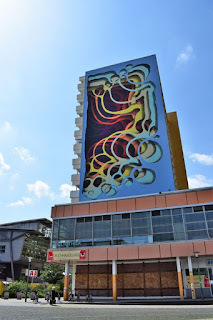 The more I explore the city, street by street, the more I discover interesting works of street art which often represent the artists feelings about the city. Like this naive representation on the walls of a building in Alt Moabit. Or a stencil on metal near Gesundbrunnen S-Bahn station. Or this interesting view over the Tree of Life, on the intersection between Haubachstraße and Fritscestraße in Charlottenburg-Wilmersdorf. Or the spectacular decoration of a classical Plattenbau in Lichtenberg. 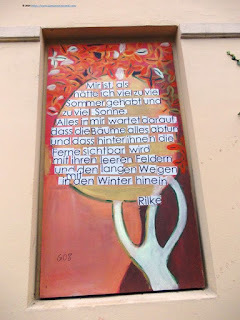 Or the poetry collage of a poem by Rilke where three places are meeting: Greifswaldstrasse/Antonplatz/Mirchbachplatz. You see, learning a high level German may be easier than you thought. Out of Klosterstraße metro station, you might feel yourself into an aquarium populated with fantastic creatures. What about this successful integration of old and new urban styles, in the middle of the old city area in Spandau? 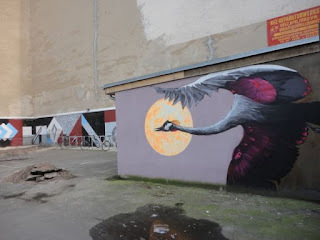 Another place I will openly recommend to any real street art lovers is Mierendorffplatz, close to Charlottenburg Palace, which has fantastic displays of creativity and artistic prodigy. By its very nature, street art is ephemeral and easily changes - including under the influence of weather conditions. In one year from now, I bet I would have a different place of new favorite places, and maybe this versatility is also why I love street art so much. Because is so human by its nature. What about you? 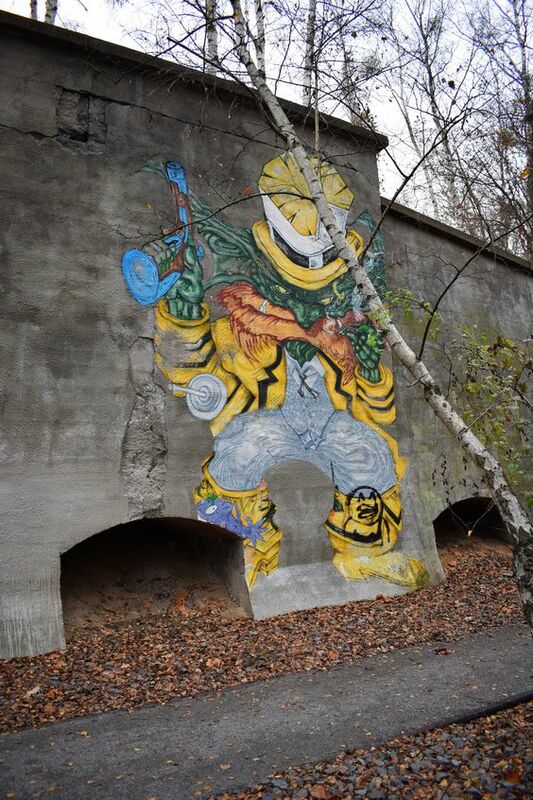 What are your favorite places for street art in your home town? Berlin has some colorful and interesting street art and public art. Are the bears still there? Thank you! Yeah, the bears are still there and once in a while they are brought together in a big square and showed to the big world! Oh! I didn't know Berlin had so much street art! I loved going through all your photos. I was surprised to learn there is a museum for street art. 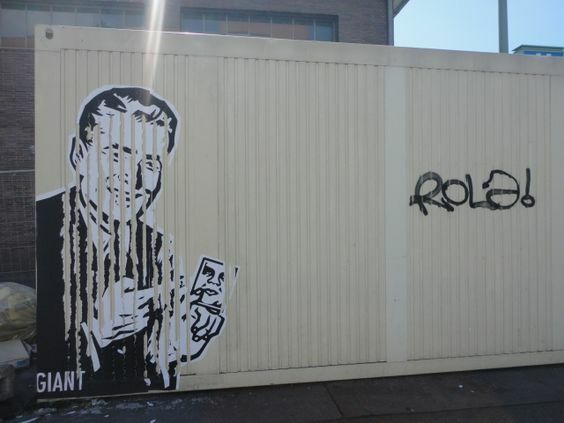 Like you, I prefer street art... in the street! I visited Berlin once, almost 4 years ago, and absolutely loved the city! I somehow missed all of this street art while there. Perhaps some of it hadn't been created yet or, more likely, I wasn't paying enough attention. Most of this street art I encountered completely randomly, when on my way to different other locations. It is also true that many of them are just created spontaneously and you need some insider's information to find them. Time to plan a new trip, it seems! Friedrichshain is quite famous for its bubbling lifestyle and there are always alternative events going on there. I had no idea that Berlin was well-known for their street art. When I was in Hong Kong I saw a bunch of street art, but nothing like this. I really like the art work in Alt Tegel. How do the artists paint a 10-floor building so beautifully?!?! It's so fascinating! Street art is always fascinating. It is a window to the times and culture of the place. 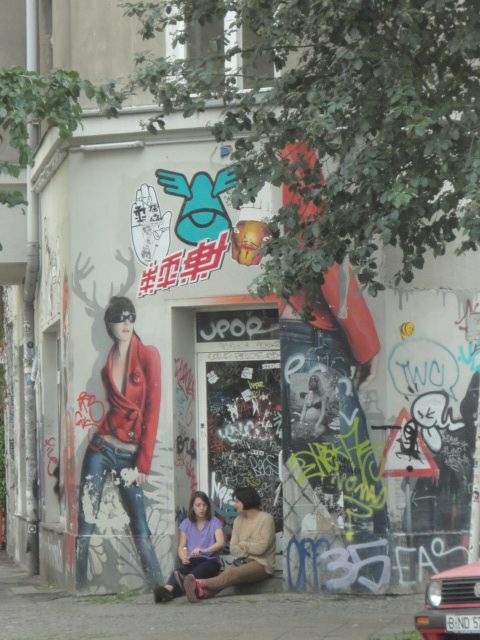 The street art in Berlin looks contemporary as well as has captured slices of history. The abstract art looks so ethereal and colourful. A silent testimony to the genius of the artists. Indeed, some of the artists really seem to be so gifted that their works cannot be called but art, regardless of the support and the environment where are created. I love the Alt-Tegel pieces too! They look very spectacular in real life!